17 page preview edition - the full issue is 44 pages. NOIR meets SCI-FI and FANTASY in this 5 issue graphic novel series: A cop becomes GUARDIAN of a gateway to the beginning and END of the universe. Each issue is 44 pages of amazing art by Eagle Award wining artist, Silvio dB. Issue #3 will be shipping in July 2017! There is a room inside an old tenement building in the Bronx. Inside the room is a doorway that leads to another dimension where past, present and future exist simultaneously. This gateway must remain protected — by the Locksmith. The problem: Santiago, the Locksmith, has died. The power is unleashed. What was once dead, seeks life. And that is just the beginning… And possibly end of the world — And the universe. 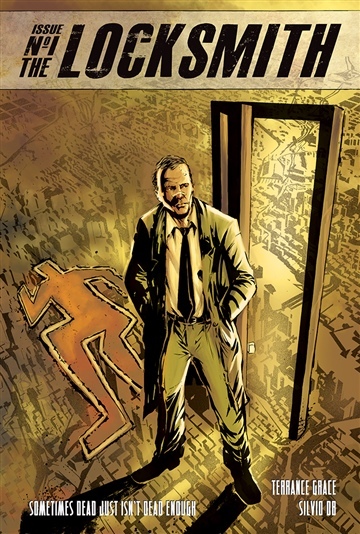 While investigating the sudden and inexplicable murder of his own brother, Detective Mick Fagan uncovers a strange series of events, all leading back to the Bronx apartment. He soon becomes convinced that he too is somehow part of this mystery, and joins forces with Santiago’s family in trying to contain what lurks beyond the doorway. A secret organization manages the hundreds of doorways around the world. But this one is different. What was once just the spirit of the undead seeking life, is now a power growing beyond what they have seen before. The room is now at the center of an ever-growing black hole of time, sweeping all that has ever existed, away. Fagan now knows that he alone holds the key to the doorway… And that key is something that happened to him as a child: His mother’s suicide. In an amazing journey back through a jungle of pre-history – Fagan is witness to his own death and rebirth within the evolution of the universe. He revisits the guilty demon inside, unlocking himself from the past… Saving the universe from certain destruction – And becoming the new Locksmith. As a screenwriter, Terrance has had six, feature-length dramatic scripts optioned. His work as a visual artist, photographer and writer, explores emotionally-charged subjects that cross cultural boundaries. Aside from The Locksmith series, Terrance is currently writing and illustrating his second graphic novel, Spanish Moss -- A ghost story set in the Louisiana bayou -- inspired by Joseph Conrad's Heart of Darkness. Silvio dB is an Eagle Award winning artist, whose credits include: Legend Of Isis (Bluewater), Clockwork (Gov't Comics), Girls Night out, Meridien City (Alpha Girl Comics), Outlaw Territory vol.03 (Eisner Award Nominated - Image comics).